To understand the devotion to the Most Precious Blood of Our Lord Jesus Christ, we should look carefully at the meaning of blood and blood that is shed. By doing this, we can then consider the meaning of the shedding of the Precious Blood of Christ. We all know that blood is biologically part of our body. However, blood is also intimately associated with the vital element of the individual as a person. 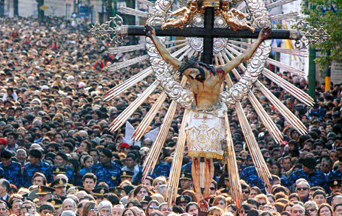 That is why we give to the Blood of Christ all the adoration due to Christ Himself. Our blood is naturally meant to be inside the body. Hence, every time we bleed, it is something of an unnatural or catastrophic nature. Many illnesses, for example, are perceived by bleeding caused by some malfunction inside the body. Bleeding is almost a sign of alarm, which because of its violence, calls attention to the fact that something is terribly wrong with the person. Besides illnesses, bleeding also calls to mind fighting and crime. For example, the idea of bloodshed instantly calls to mind the blood of Abel, shed by Cain and which, according to Scripture, rose to God clamoring for vengeance. When blood is shed by crime, we sense a profound violence applied to the body that conveys the idea of something unjust, brutal and iniquitous which profoundly disturbs an existing order and clamors to God for the reestablishment of order. 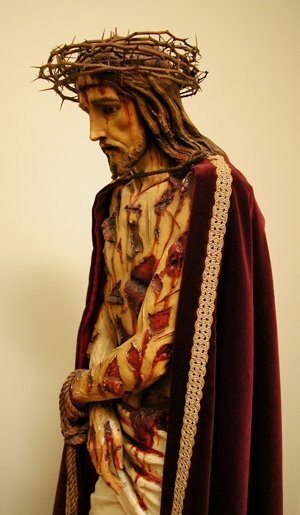 That Blood was shed by the great anguish of soul when Our Lord, in His agony, began to suffer and sweat blood all over His Body. When we consider the infinitely Precious Blood of Our Lord Jesus Christ, many things come to mind. We think of that blood begotten in the womb of Our Lady. We think of that Blood that was shed, leaving His Body from whence it should never have left. That Blood, like everything else in the Body of Christ, is in hypostatic union with Him and when it leaves His sacred Body, it is as if symbolizing all the dignity of that Body. We might compare this departure to the juice that comes from the grape to make up wine. That juice represents the essence of the grape, all the best the grape has to give. So also Our Lord’s Blood represents the best of blood – the blood of David, the blood of Mary, the Blood of God-Man. Through a series of unspeakable, violent deicidal actions, that Blood was shed in the scourging, the crowning with thorns, the cross, and torments of all kinds. That Blood was shed by the great anguish of soul when Our Lord, in His agony, began to suffer and sweat blood all over His Body. That Blood shed and falling on the ground clamorously attests to the insult made to the God-Man. It is a manifestation of how far human wickedness can go. It is a manifestation of the mystery of iniquity. We see in that Blood how much God tolerates. We are reminded how fallen human nature in this valley of tears (above all when guided by sin and the devil) is capable of going to the extremes of evil shrinking from nothing. These considerations should lead us to always be extremely suspicious towards evil. We should follow Our Lord’s precept: “Watch and pray.” Our suspicions are based on the fact that evil is capable of the worst infamies. One can expect everything from it. Thus, we should do great violence to ourselves to fight against it. We should avoid all drowsiness, foolish optimism or procrastination in face of evil. Indeed, failing to combat evil is a true crime since we see that if evil was capable of such horrible acts against Our Lord, it is capable of everything. Evil calls unto other evils and can go to the very depths of all evil. In a sense, every drop of blood is like a tiny death, for it is a drop of life that goes away. Our Lord wanted to go through these “deaths” to show how infinite is His love for us. Looking at this bloodshed, we should note that the mercy of God wanted all that Blood to be shed with unheard-of abundance. All the blood in the Body of Our Lord Jesus Christ was shed, as if to show that He gave us everything, without holding back even one drop, because of His immense desire to save us. One drop of His blood would have sufficed, yet He shed all His blood to the point that the last drops were mixed with water that left His Side when Longinus pierced His Heart with the lance. He wanted to hold nothing back in order to redeem us. However, He did even more than just giving His life. He wished to suffer death from the beatings, anguish and the shedding of every drop of blood in His sacred Body. In this sense, every drop of blood is like a tiny death, for it is a drop of life that goes away. He wanted to go through all these “deaths” to show how infinite was His friendship for us. Such considerations lead us to confide in His mercy. If He so wanted to save us, we should understand that we might cover ourselves in His Blood and present ourselves to the Eternal Father. Begging forgiveness thus covered in His Blood, we should confide that we can obtain it. On the other hand, we must consider how horrible is the eternal destiny of the damned. If Our Lord suffered all these torments to spare us from eternal doom, then this damnation is a very serious thing. So let us meditate on the depths of Hell by considering a drop of the Blood of Our Lord Jesus Christ. This inevitably leads us to other considerations. First, we must see how the Blood of Christ calls to mind the tears of Mary, shed along with the Blood of Christ. Our Lord did not want Our Lady to shed any drop of her own blood. He allowed all types of torments against Himself but forbade the powers of evil from raising even a finger against His Immaculate Mother. Thus, she suffered no physical torments. None of her blood was shed on behalf of humanity, nor would it have had the redeeming force of the infinitely precious Blood of Christ. The entire Redemption would come specifically from the Blood of Our Lord Jesus Christ. However, Our Lady did shed a kind of blood: Her tears. It would serve as only a kind of complement to Our Lord’s Blood. We can say that tears are the blood of the soul. She suffered all the pain of His death and shed tears. That is why it is impossible to think about the Blood of Christ without at the same time considering the tears of Mary that were joined to that Blood and constituted the first tribute of Christendom to complete the part of His Passion that God wanted to be completed – with the suffering of the faithful – so that souls would be saved in great numbers. Finally, we should think about the Holy Eucharist. The Blood of Christ was shed in streets, squares, Pilate’s palace and on top of Mount Calvary. That Blood of Christ is found entirely in the Holy Eucharist. How many times we have received this Blood of Christ in us. Thus, as we receive the Body and Blood of Our Lord Jesus Christ, we should remember this. We are receiving this Precious Blood, shed for us. Inside us, it is like the blood of Abel, not to clamor for punishment against us, but to clamor for mercy for us. 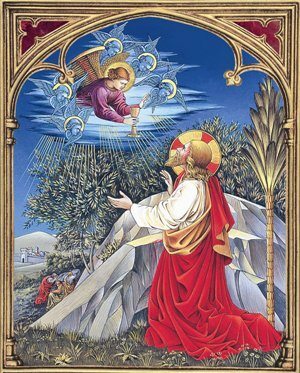 So let us receive the Eucharist with great confidence and joy, as we receive the Blood of Christ that rises to Heaven clamoring for mercy on our behalf. The preceding article is taken from an informal lecture Professor Plinio Corrêa de Oliveira gave on July 1, 1965. It has been translated and adapted for publication without his revision. –Ed. This entry was posted in Catholic Perspective, Plinio Corrêa de Oliveira and tagged abel cain, blood, ddevotion. Most Precious Blood of Jesus Christ, Holy Eucharist, Our Lady, Redemption, Sacred Body, superabundance by Plinio Corrêa de Oliveira. Bookmark the permalink.